It was announced by the Turkish Prime Minister Binali Yıldırım that the tender for the controversial Canal Istanbul project is to be held by the end of this year. Kanal Istanbul, is one of the future planned huge projects in Istanbuls city pipeline advanced by the government and President Recep Tayyip Erdoğan, Canal Istanbul project is said to be 43 kilometers long and 400 meters wide with six bridges, according to sources. Erdoğan, who had dubbed the canal Istanbul one of the “crazy projects,” has called on related state bodies to speed up the project, which has decayed off the schedual agenda since being the maximum height of the buildings to be constructed on the banks of the canal will be limited to six stories high , generating a residence surface for 500,000 people, which is well below the original plan for 1.2 million, according to an outcome that materialized from a recent meeting where the president and related state institutions where present , sources said. The basis of the project will be Seljuk-style architecture , which will turn the European side of Istanbul enclosed by the inner Marmara Sea and the Black Sea into an island. In charge of the present project is the ruling Justice and Development Party (AKP) headed Istanbul Metropolitan Municipality . During the general elections four years ago in a campaign pledge it was said . The municipality will construct two bridges over the canal in addition to four others undertaken by the directorate of highways. The bigger plot will provide a city outline with new buildings constructed at gradual heights , the new area will also contain villa style buildings, sources said. To increase safety on the Bosphorus , the 25 meter deep canal will allow tankers to by pass the Bosphorus sea traffic on the busy waterway. Fees for the speedy passage of ships through the new canal will also fetch in money for Istanbul’s budget. Currently the State institutions are working on the exact route of the canal. Plans for Istanbuls very large third airport have been changed due to the wait in the Kanal Istanbul efforts, as contractors were devising to use soil from the canal digging as landfill for the airport, which is being constructed over a previous mining area to the north of the Istanbul. Experts say the delay has caused a large jump in the expense of the airport. 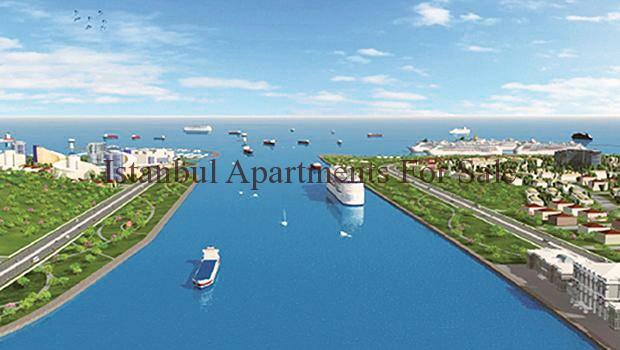 There have been many objections to the Canal Istanbul project from environmentalists . One of the concerns is the case that salt water will be lead from the Black Sea between the canal and affect the water in the Marmara Sea to be without oxygen, which may distrub many species of wildlife. Cemal Saydam of Hacettepe University and Etham Gönenç from the Civil Engineering Department of Istanbul Technical University in 2013 said that the project would cause the entirety of the area around the Marmara and the Bosphorus to smell of hydrogen sulfide, or rotten eggs. They also said Canal Istanbul will affect the European side undergound water sources . Yildirim also gave details about other Istanbul mega projects.The first stage of 3rd Airport will be open in 2018.